Summer is here and the rains have finally come to our Alberta Foothills which has certainly brought on the grass along with beautiful flowers and other plants. 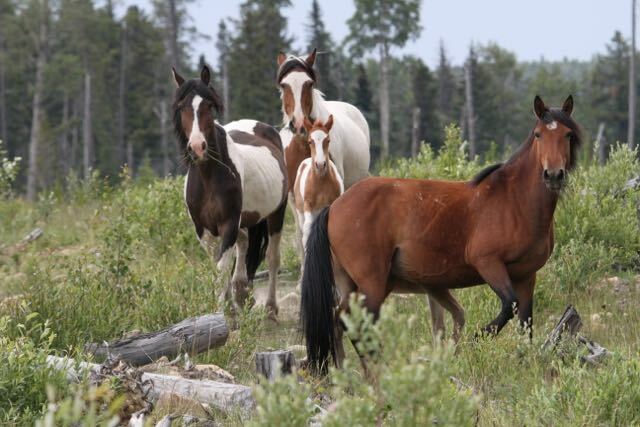 This has definitely been beneficial to our wild horses. Here one family group is at a mineral lick and another group patiently awaits it’s turn. 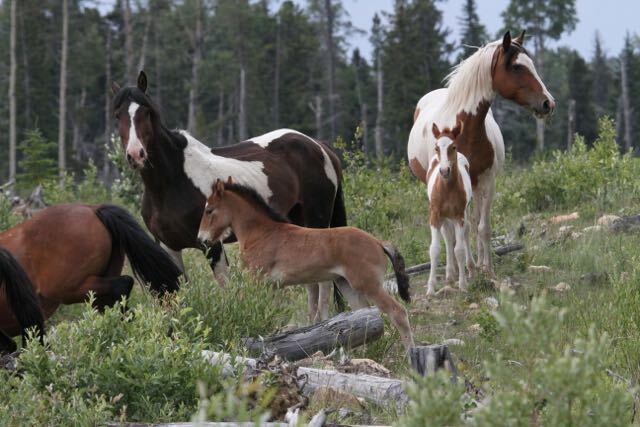 Altogether there are 6 foals, 3 in each herd. 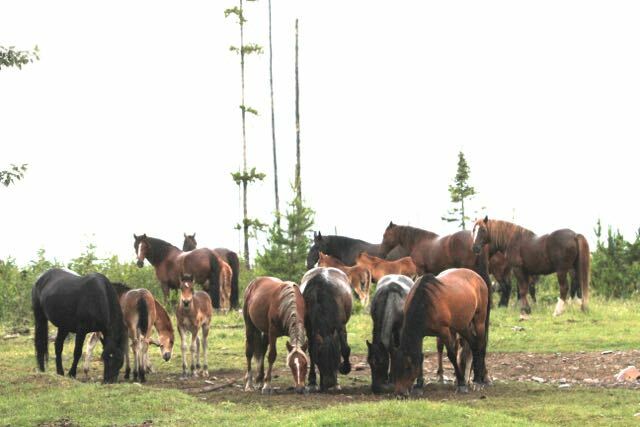 As we travelled along the back country trails we continued to run into numerous groups with most of them having at least one foal with them. This little one is getting help from mom’s tail swishing to keep the hoards of black flies away. This year in our travels we have started to find more and more Paint (spotted) horses. After so many years of finding very few of them, it is interesting to see how the colour gene has resurfaced. Back in the 60s and 70s there used to be a large number of Paints roaming with the herds. 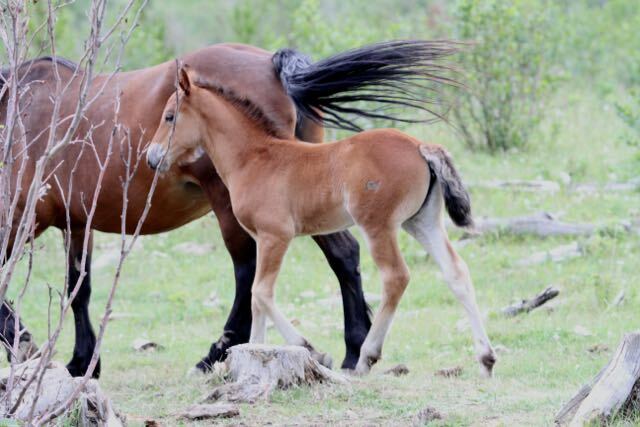 During this period, despite some claims that the wild horses are just recently growing in numbers, records show that there were estimated to be around 2,000 – 3,000 horses roaming free in the central Alberta foothills. 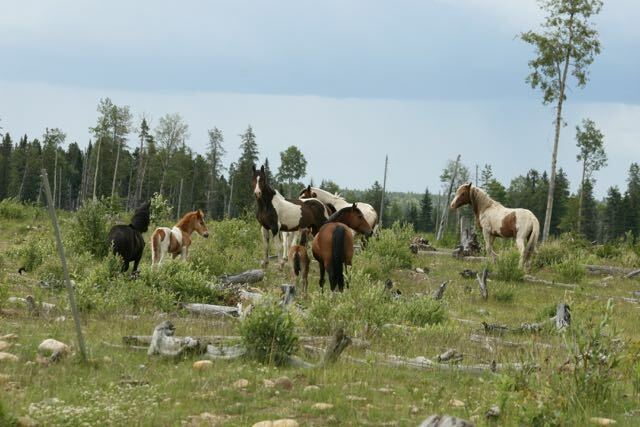 On one particular day we were so thrilled to find a herd with a beautiful Paint stallion along with two Paint mares. 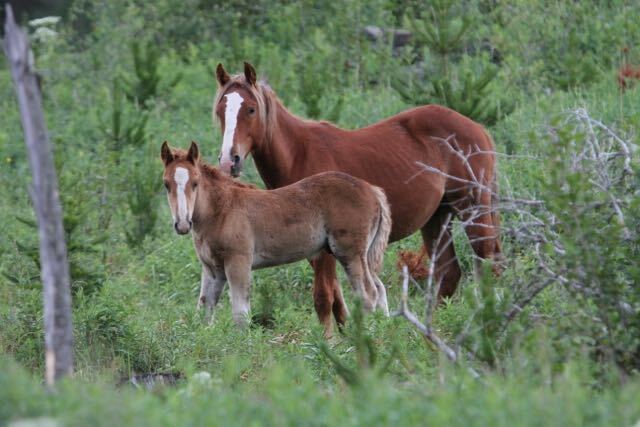 What was so exciting was the fact that two of the mares also had Paint foals with them. 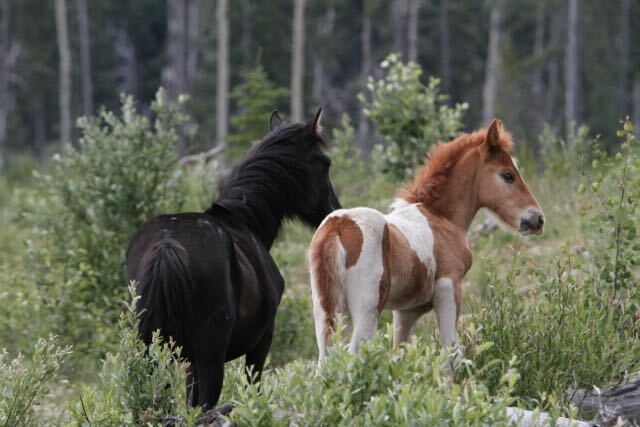 In this picture you can see this year’s Paint foal standing next to its yearling brother who is almost solid black, despite having the same sire. 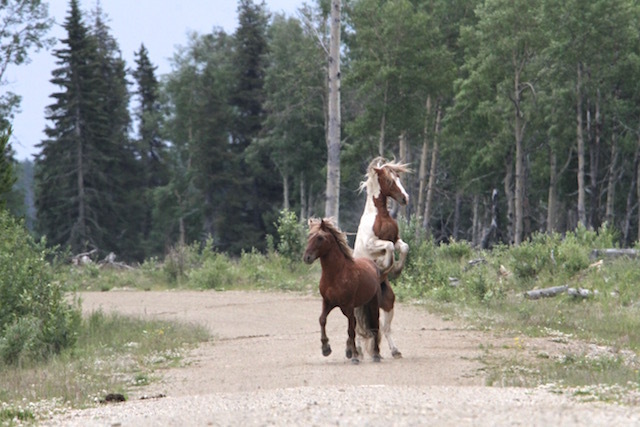 While photographing the herd, there were three other groups in the immediate area including one 3-year old sorrel stud with flaxen mane who was trying assert some sort of dominance. When the young boy got too close to the Paint mares, a discussion ensued! 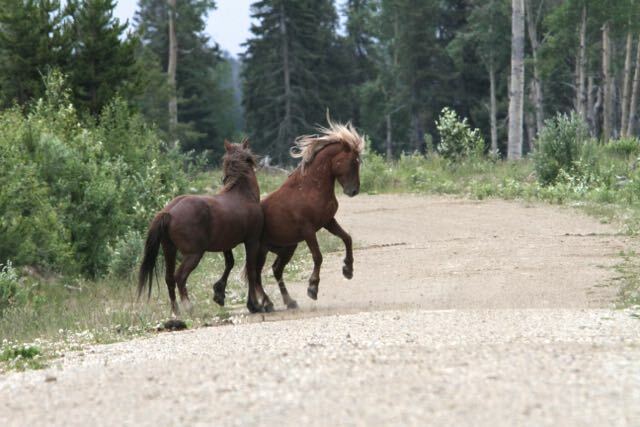 The golden boy quickly got the hint and moved on to test another stallion who was close by. 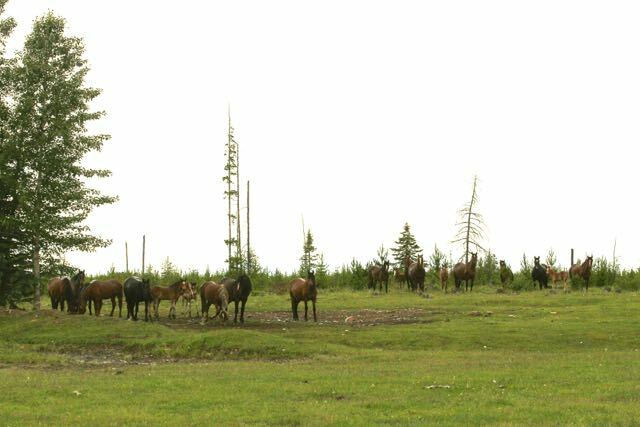 When this challenge also failed, he wandered off leaving the other herds to peacefully feed. 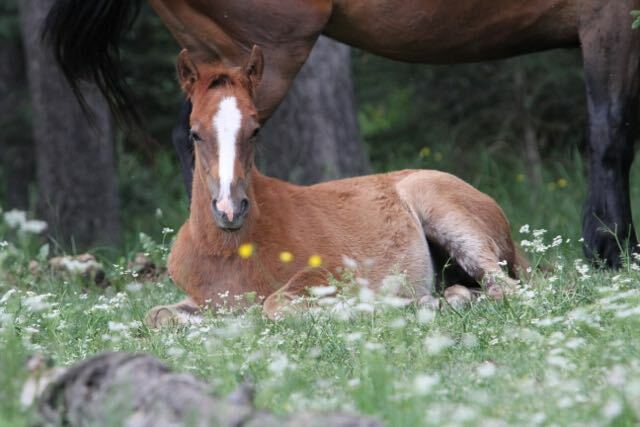 It is certainly nice to see so many foals thriving so far this summer. 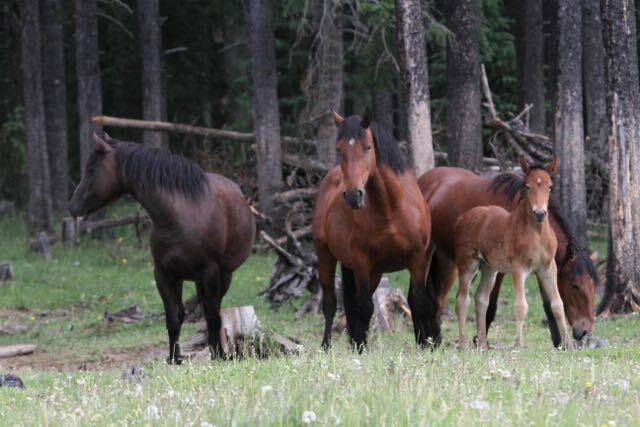 Hopefully the survival rate for the foals will be higher than it has been in past years. Through all this beautiful and wonderful new life we get to observe, occasionally we come across a tragedy. Such was the case this past Sunday when we found an approximately 3-year old stud who had impaled himself on an Alberta survey marker. How it happened we do not know, nor do we want to negatively speculate. The metal marker was bent and he must have run into it, piercing into his chest and heart area. He extricated himself but died nearby. Apparently these markers, called monuments, are not used anymore and are left throughout public lands. 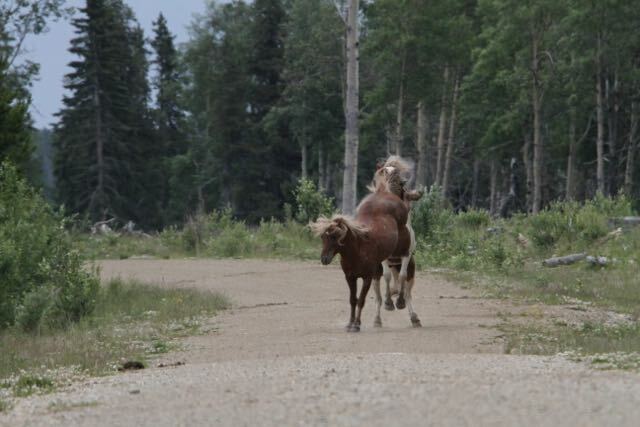 This just shows that the life of our wild horses is not an easy one. 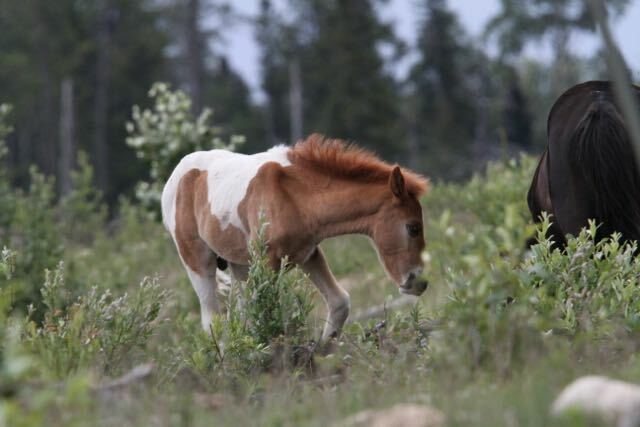 But to leave you on a positive note, here is another baby picture of a yearling colt and his new brother. Remember to order your raffle tickets for a chance to win the Heartland prize. They are $10 and can be ordered online. Just click on the Heartland Prize Fundraiser page at the top of our webpage. Good luck and thanks for supporting WHOAS.